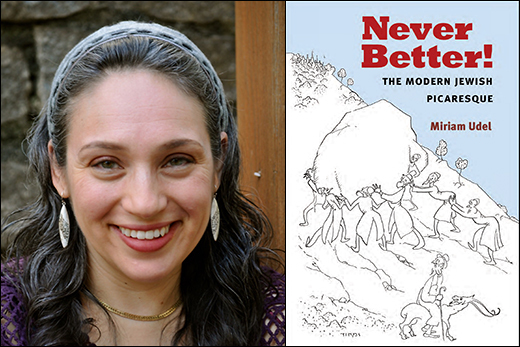 Miriam Udel, associate professor of Yiddish language, literature and culture, has won the National Jewish Book Award in Modern Jewish Thought and Experience for her work, "Never Better! The Modern Jewish Picaresque." An Emory College German Studies professor will receive a national award for her debut book examining the evolution of protagonists in modern Yiddish literature. Her book examines Yiddish fiction as it grew out of the Jewish enlightenment of the 18th and 19th centuries — which, like broader literature, was concerned with the repair and improvement of readers — and into a genre less driven by change. The title gestures at the comic spirit of one of the authors she writes about, Sholem Aleichem. His characters might have answered the question, “How are you?” with a cheerful, “Never better!” even as they feared life might not actually get better. The genre therefore embraces the Jewish role of outsider or person living at the margins of community. In that way, literature has been a response to the marginalization of Jews and Jewish aspiration, Udel says. The Jewish Book Council will honor Udel and other award winners at a ceremony in March at the Center for Jewish History in New York City. The council began recognizing authors through its awards program in 1950. Hiram Maxim, chair of the Emory German Studies department, is proud of the Udel’s award and its timing, coming during her second year of a deep dive with Emory colleagues into the often overlooked body of 20th-century Yiddish children’s literature published between and immediately after World Wars I and II. “The award is a wonderful affirmation of Dr. Udel’s outstanding contribution to the scholarship on modernist Jewish literature, and the department is already excited about her next book project on Yiddish children’s literature, a topic that she is exploring this semester in a jointly taught course with Dr. Marshall Duke from the psychology department,” Maxim says. Udel says she also collaborated with her husband, Adam Zachary Newton, a distinguished visiting professor at the Fox Center for Humanistic Inquiry, on her debut book. She is eager to personally present the book to the only living author whose work she addresses, celebrated Israeli novelist David Grossman. Grossman will lecture as part of the 20th anniversary of the Tenenbaum Family Lecture in Judaic Studies on Feb. 28. “It will be an honor,” Udel says.